My mother is no longer with us here, exactly; nor is she there, safely gathered in that place to which she is going. She is in-between, on a long and labyrinthine pilgrim route. I remember my father-in-law saying, in his final days, with a rambling but urgent mind: I’ve got to get across to the piney bluff. So, she goes. 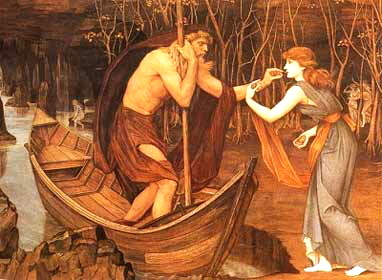 The mythic ferryman to the Greeks, Charon carried traveling souls across the uncertain river Styx. I keep imagining Charon’s presence in this room, his tossing boat, as my mother’s body moves to unseen swells, her hands rise and fall, her face creases, surprised; her feet stir beneath the white sails of sheets, steadying her way. If dying is a passage, then, for my mother, it is a long and arduous one. She is beyond words, beyond water and food, beyond the music of the harp that serenades her, the hands that enfold hers. She is traveling beyond where any of us here have ever gone, laboring at times in silent birth, fighting, it seems, at others, between two worlds. I have a long chat with her, too, suggesting we be honest. We didn’t always understand each other. Forgive me, I hold her hand in both of mine, as I forgive you. I want to make the crooked roads straight, the rough places plain. I want to smooth her way, smooth her gown, smooth her furrowed brow. Yet, she trembles on the way. The boat rocks. I’ve always thought of my mother as she lived in relation to others. As a wife to my father, inseparably navigating their sixty years together. As a mother to her children; a devoted daughter to her mother; a counselor to the those who sought her kindness. Now, it seems to me that she is alone is this last crossing. Yes, many friends surround her. Her family holds her close, we sing around her bed. But when she utters a faint cry, it sounds as from a land far off. We do not know, not one of us, where she is. Or what she sees and knows. Or how far she has traveled toward the other shore. This is her journey. She will take what time she needs. There are, if any, her demons to vanquish, her fears to subdue, her faith to carry her on. Relatives used to put coins on the lips of the departed – fees for the ferryman. I will simply plant a kiss and a prayer, and a final respect for how strong she seems on this pilgrim way. How much is being asked of her. How hard she labors, on and on, to reach that piney bluff. ~ by Susan on 08/18/2012. Again, Susan, I’m so incredibly touched by how eloquently you portray her journey in words and emotions that I can only imagine. Because I wasn’t able to be with my own mother during her sudden passing more than a decade ago, reading your beautiful words touches feelings in me that honestly have not surfaced since she was here with us. I ache for you, and yet thank you so much for selflessly sharing. Peace and love to you, your mother, and all of her friends and loved ones. I will continue to hold you in my heart as you journey on the path beyond your mother’s footprints. I must thank you again!! Again, you have touch my soul. Thank you for sharing.